Thoracic outlet syndrome is not the name of a single entity but rather a collective title for a variety of conditions attributed to the compression of neurovascular structures as they traverse the thoracic outlet. [1, 2, 3, 4, 5, 6] The thoracic outlet is bordered by the scalene muscles, first rib, and clavicle. Neurovascular structures pass from the neck and thorax into the axilla through this space. Thoracic outlet syndrome remains one of the most controversial clinical entities in medicine. [7, 8, 9] See the image below. 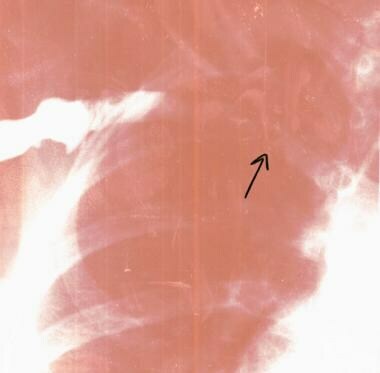 Thoracic outlet syndrome in a 16-year-old volleyball player with a stenotic right subclavian vein (arrow) secondary to fibrosis. To exclude systemic disease and inflammation, a few simple blood tests may refine the differential diagnosis for thoracic outlet syndrome, including a blood glucose level, complete blood cell (CBC) count, erythrocyte sedimentation rate (ESR), basic metabolic panel, thyrotropin level, and rheumatologic workup, if indicated. Electrodiagnostic studies can be helpful in classic cases of neurogenic thoracic outlet syndrome. However, many symptoms are intermittent in this disorder; therefore, negative test results do not rule out the diagnosis. Surgery in cases of thoracic outlet syndrome is indicated for acute vascular insufficiency and progressive neurologic dysfunction. Other patients should receive nonoperative treatment that, in the acute phase, includes relative rest, nonsteroidal anti-inflammatory medications (NSAIDs), cervicoscapular strengthening exercises, and modalities such as ultrasound, transcutaneous nerve stimulation, and biofeedback. Physiotherapy in the acute phase focuses on pain control and range of motion with specific stretching exercises. For patient education information, see Shoulder and Neck Pain and Electromyography (EMG). The neurovascular bundle courses through 3 spaces, or triangles, as it exits the neck to reach the axilla and proximal arm. All 3 spaces can be the source of compression of the various components of the neurovascular bundle, including the brachial plexus and the subclavian vessels. These spaces are small at rest and become even smaller with certain arm maneuvers, such as abduction and external rotation. [14, 15] This can aid in the diagnosis of thoracic outlet syndrome and forms the basis for provocative testing, which is discussed later (see Clinical, Physical). The second space is the costoclavicular triangle, which is bordered by the clavicle, first rib, and scapula and contains the subclavian artery and vein and the brachial nerves. The third and final space is beneath the coracoid process just deep to the pectoralis minor tendon; it is referred to as the subcoracoid space. Thoracic outlet syndrome is most often seen in patients who engage in repetitive motions that place the shoulder at the extreme of abduction and external rotation. An example of such activity is swimming, especially with the freestyle stroke, butterfly stroke, and backstroke. When a swimmer reports tightness and pain around the shoulder, neck, and clavicle as his or her hand enters the water, thoracic outlet syndrome should be suspected. In addition to swimmers, other athletes affected by thoracic outlet syndrome include water polo, baseball, and tennis players and athletes in any other activity that places repetitive stress on the shoulder at the extremes of abduction and external rotation. These individuals may present with neurologic and arterial or venous symptoms. Venous thoracic outlet syndrome most commonly develops in young male athletes in whom the upper extremity musculature is overdeveloped as a result of work or physical conditioning. Baseball players, whose sport requires repetitive throwing motions, are at increased risk for arterial thoracic outlet syndrome in their dominant arm. Arthur LG, Teich S, Hogan M, Caniano DA, Smead W. Pediatric thoracic outlet syndrome: a disorder with serious vascular complications. J Pediatr Surg. 2008 Jun. 43(6):1089-94. [Medline]. Sadat U, Weerakkody R, Varty K. Thoracic outlet syndrome: an overview. Br J Hosp Med (Lond). 2008 May. 69(5):260-3. [Medline]. Kaymak B, Ozçakar L, Inanici F, et al. Forearm bone mineral density measurements in thoracic outlet syndrome. Rheumatol Int. 2008 Jul. 28(9):891-893. [Medline]. Oates SD, Daley RA. Thoracic outlet syndrome. Hand Clin. 1996 Nov. 12(4):705-18. [Medline]. Teddy PJ, Johnson RD, Cai RR, Wallace D. Surgery for paediatric thoracic outlet syndrome. J Clin Neurosci. 2011 Nov 1. [Medline]. Hussain MA, Aljabri B, Al-Omran M. Vascular Thoracic Outlet Syndrome. Semin Thorac Cardiovasc Surg. 2016 Spring. 28 (1):151-7. [Medline]. [Full Text]. Cuetter AC, Bartoszek DM. The thoracic outlet syndrome: controversies, overdiagnosis, overtreatment, and recommendations for management. Muscle Nerve. 1989 May. 12(5):410-9. [Medline]. Roos DB. Thoracic outlet syndrome is underdiagnosed. Muscle Nerve. 1999 Jan. 22(1):126-9; discussion 137-8. [Medline]. Wilbourn AJ. Thoracic outlet syndrome is overdiagnosed. Muscle Nerve. 1999 Jan. 22(1):130-6; discussion 136-7. [Medline]. Urschel HC Jr, Patel AN. Surgery remains the most effective treatment for Paget-Schroetter syndrome: 50 years' experience. Ann Thorac Surg. 2008 Jul. 86(1):254-60; discussion 260. [Medline]. Huang JH, Zager EL. Thoracic outlet syndrome. Neurosurgery. 2004 Oct. 55(4):897-902; discussion 902-3. [Medline]. Safran MR. Nerve injury about the shoulder in athletes. Part 2: long thoracic nerve, spinal accessory nerve, burners/stingers, thoracic outlet syndrome. Am J Sports Med. 2004 Jun. 32(4):1063-76. [Medline]. Parziale JR, Akelman E, Weiss AP, Green A. Thoracic outlet syndrome. Am J Orthop. 2000 May. 29(5):353-60. [Medline]. Rutherford RB, Cronewett JL, Gloviczki P. Vascular Surgery. 5th ed. Philadelphia, Pa: WB Saunders Co; 2000. 1184-1219. Moore WS, ed. Vascular Surgery: A Comprehensive Review. 4th ed. Philadelphia, Pa: WB Saunders Co; 1993. 600-3. Mackinnon SE, Novak CB. Thoracic outlet syndrome. Curr Probl Surg. 2002 Nov. 39(11):1070-145. [Medline]. Hood DB, Kuehne J, Yellin AE, Weaver FA. Vascular complications of thoracic outlet syndrome. Am Surg. 1997 Oct. 63(10):913-7. [Medline]. Rayan GM. Lower trunk brachial plexus compression neuropathy due to cervical rib in young athletes. Am J Sports Med. 1988 Jan-Feb. 16(1):77-9. [Medline]. Roos DB. Congenital anomalies associated with thoracic outlet syndrome. Anatomy, symptoms, diagnosis, and treatment. Am J Surg. 1976 Dec. 132(6):771-8. [Medline]. Esposito MD, Arrington JA, Blackshear MN, Murtagh FR, Silbiger ML. Thoracic outlet syndrome in a throwing athlete diagnosed with MRI and MRA. J Magn Reson Imaging. 1997 May-Jun. 7(3):598-9. [Medline]. Al-Shekhlee A, Katirji B. Spinal accessory neuropathy, droopy shoulder, and thoracic outlet syndrome. Muscle Nerve. 2003 Sep. 28(3):383-5. [Medline]. Fujita K, Matsuda K, Sakai Y, Sakai H, Mizuno K. Late thoracic outlet syndrome secondary to malunion of the fractured clavicle: case report and review of the literature. J Trauma. 2001 Feb. 50(2):332-5. [Medline]. Upton AR, McComas AJ. The double crush in nerve entrapment syndromes. Lancet. 1973 Aug 18. 2(7825):359-62. [Medline]. Urschel HC Jr, Razzuk MA. Neurovascular compression in the thoracic outlet: changing management over 50 years. Ann Surg. 1998 Oct. 228(4):609-17. [Medline]. [Full Text]. Wood VE, Twito R, Verska JM. Thoracic outlet syndrome. The results of first rib resection in 100 patients. Orthop Clin North Am. 1988 Jan. 19(1):131-46. [Medline]. Novak CB, Mackinnon SE, Patterson GA. Evaluation of patients with thoracic outlet syndrome. J Hand Surg [Am]. 1993 Mar. 18(2):292-9. [Medline]. Lee PP, Dorsi MJ, Belzberg AJ, Chhabra A. Magnetic resonance neurography-surgical correlation of neurologic thoracic outlet syndrome. Microsurgery. 2011 Nov. 31(8):662-5. [Medline]. Chavhan GB, Batmanabane V, Muthusami P, Towbin AJ, Borschel GH. MRI of thoracic outlet syndrome in children. Pediatr Radiol. 2017 Sep. 47 (10):1222-1234. [Medline]. Machleder HI, Moll F, Nuwer M, Jordan S. Somatosensory evoked potentials in the assessment of thoracic outlet compression syndrome. J Vasc Surg. 1987 Aug. 6(2):177-84. [Medline]. Komanetsky RM, Novak CB, Mackinnon SE, et al. Somatosensory evoked potentials fail to diagnose thoracic outlet syndrome. J Hand Surg [Am]. 1996 Jul. 21(4):662-6. [Medline]. Sanders RJ, Hammond SL. Venous thoracic outlet syndrome. Hand Clin. 2004 Feb. 20(1):113-8, viii. [Medline]. Melby SJ, Vedantham S, Narra VR, et al. Comprehensive surgical management of the competitive athlete with effort thrombosis of the subclavian vein (Paget-Schroetter syndrome). J Vasc Surg. 2008 Apr. 47(4):809-20; discussion 821. [Medline]. Machleder HI. Evaluation of a new treatment strategy for Paget-Schroetter syndrome: spontaneous thrombosis of the axillary-subclavian vein. J Vasc Surg. 1993 Feb. 17(2):305-15; discussion 316-7. [Medline]. Urschel HC Jr, Razzuk MA. Paget-Schroetter syndrome: what is the best management?. Ann Thorac Surg. 2000 Jun. 69(6):1663-8; discussion 1668-9. [Medline]. Patton GM. Arterial thoracic outlet syndrome. Hand Clin. 2004 Feb. 20(1):107-11, viii. [Medline]. Dale WA, Lewis MR. Management of thoracic outlet syndrome. Ann Surg. 1975 May. 181(5):575-85. [Medline]. [Full Text]. Sucher BM. Ultrasonography-guided osteopathic manipulative treatment for a patient with thoracic outlet syndrome. J Am Osteopath Assoc. 2011 Sep. 111(9):543-7. [Medline]. Kenny RA, Traynor GB, Withington D, Keegan DJ. Thoracic outlet syndrome: a useful exercise treatment option. Am J Surg. 1993 Feb. 165(2):282-4. [Medline]. Lindgren KA. Conservative treatment of thoracic outlet syndrome: a 2-year follow-up. Arch Phys Med Rehabil. 1997 Apr. 78(4):373-8. [Medline]. Novak CB, Collins ED, Mackinnon SE. Outcome following conservative management of thoracic outlet syndrome. J Hand Surg [Am]. 1995 Jul. 20(4):542-8. [Medline]. Novak CB. Conservative management of thoracic outlet syndrome. Semin Thorac Cardiovasc Surg. 1996 Apr. 8(2):201-7. [Medline]. Peek J, Vos CG, Ünlü Ç, van de Pavoordt HDWM, van den Akker PJ, de Vries JPM. Outcome of Surgical Treatment for Thoracic Outlet Syndrome: Systematic Review and Meta-Analysis. Ann Vasc Surg. 2017 Apr. 40:303-326. [Medline]. Leffert RD. Complications of surgery for thoracic outlet syndrome. Hand Clin. 2004 Feb. 20(1):91-8. [Medline]. Terzis JK, Kokkalis ZT. Supraclavicular approach for thoracic outlet syndrome. Hand (N Y). 2010 Sep. 5(3):326-37. [Medline]. [Full Text]. Siracuse JJ, Johnston PC, Jones DW, et al. Infraclavicular first rib resection for the treatment of acute venous thoracic outlet syndrome. J Vasc Surg Venous Lymphat Disord. 2015 Oct. 3 (4):397-400. [Medline]. Vemuri C, Wittenberg AM, Caputo FJ, Earley JA, Driskill MR, Rastogi R, et al. Early effectiveness of isolated pectoralis minor tenotomy in selected patients with neurogenic thoracic outlet syndrome. J Vasc Surg. 2013 Jan 31. [Medline]. Balci AE, Balci TA, Cakir O, Eren S, Eren MN. Surgical treatment of thoracic outlet syndrome: effect and results of surgery. Ann Thorac Surg. 2003 Apr. 75(4):1091-6; discussion 1096. [Medline]. Peek J, Vos CG, Unlu C, van de Pavoordt HD, van den Akker PJ, de Vries JP. Outcome of Surgical Treatment for Thoracic Outlet Syndrome: Systematic Review and Meta-Analysis. Ann Vasc Surg. 2016 Sep 22. [Medline]. Franklin GM, Fulton-Kehoe D, Bradley C, Smith-Weller T. Outcome of surgery for thoracic outlet syndrome in Washington state workers' compensation. Neurology. 2000 Mar 28. 54(6):1252-7. [Medline]. Orlando MS, Likes KC, Mirza S, Cao Y, Cohen A, Lum YW, et al. A decade of excellent outcomes after surgical intervention in 538 patients with thoracic outlet syndrome. J Am Coll Surg. 2015 May. 220 (5):934-9. [Medline]. Foley JM, Finlayson H, Travlos A. A review of thoracic outlet syndrome and the possible role of botulinum toxin in the treatment of this syndrome. Toxins (Basel). 2012 Nov. 4(11):1223-35. [Medline]. Povlsen B, Hansson T, Povlsen SD. Treatment for thoracic outlet syndrome. Cochrane Database Syst Rev. 2014 Nov 26. 11:CD007218. [Medline]. Atasoy E. Recurrent thoracic outlet syndrome. Hand Clin. 2004 Feb. 20(1):99-105. [Medline]. Kim TI, Sarac TP, Orion KC. Intravascular Ultrasound in Venous Thoracic Outlet Syndrome. Ann Vasc Surg. 2019 Jan. 54:118-122. [Medline]. Disclosure: Received consulting fee from Biomet, Inc. for speaking and teaching; Received grant/research funds from Smith and Nephew for fellowship funding; Received grant/research funds from DJ Ortho for course funding; Received grant/research funds from Athletico Physical Therapy for course, research funding; Received royalty from Biomet, Inc. for consulting. What Is the Best Modality for Diagnosing Pure Neurogenic Thoracic Outlet Syndrome?